After an emergency phone call from her niece, recently dumped Hattie returns home from Paris where she discovers her sister has been readmitted to the psych ward and her 11 year old niece and 15 year old nephew are fending for themselves. Attempting to take charge, Hattie decides it's time to find their father and the quirky trio embark on a road trip full of self discovery, not only about themselves, but each other and learn the meaning of love and family along the way. 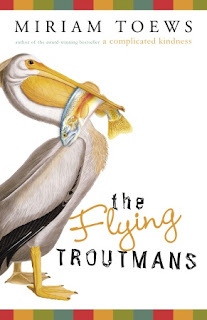 I enjoyed The Flying Troutmans with its quirky sense of humour and unique characters and don’t think I’ve read anything quite like it. The story was simple and often sad, yet the characters were rich with history and flaws which kept this story alive and the children leapt off the page as if they were real. It was a satisfying tale of the bond of family ties and it was the relationship between an aunt and her niece and nephew that kept me fascinated. My niece turned eight months old while I was reading this tale and I could relate to Hattie’s return to help her sister and her kids as I’m pretty sure there is nothing I wouldn’t do for my little niece or my brother and fabulous sister in law. Kathryn’s point about an epilogue is interesting. On the one hand, I would have liked to know what happened sometime down the road in their lives, but on the other hand, I like to have my own ideas of what their future held. I guess it depends on your preference whether you will be satisfied with the ending, but it definitely doesn’t all wrap up quite so neatly which is par for the entire novel. Overall, if you want a quirky, Canadian read, The Flying Troutmans fits the bill! I’d have to say that I’ve never read a book quite like this one. It’s a bit strange and a bit quirky but that really appealed to me. The dialogue is strangely written without quotation marks, just he said/she said in the middle of the paragraphs and surprisingly this didn’t bother me. Thebes is at once a precocious 11-year-old and a lost little girl and she has some peculiar thoughts. Logan seems more a “normal” 15-year-old as he is rebellious and a bit of a loner, but I was always happy that he really does care about his little sister and wants her to be safe and happy despite him finding her incessantly irritating! Along the drive Hattie is never sure how to care for these kids, who obviously have had a somewhat disjointed upbringing, and is constantly worried that her sister won’t want to try to get better again. The search for their father realistically becomes quite important but you never feel as if the kids are in serious trouble. Although you know in the back of your mind that the premise of the story is serious the whole novel is really funny, I laughed out loud several times. You can’t help really being drawn to the kids and liking them. My only down thought was that I wanted to know more, I needed an epilogue!